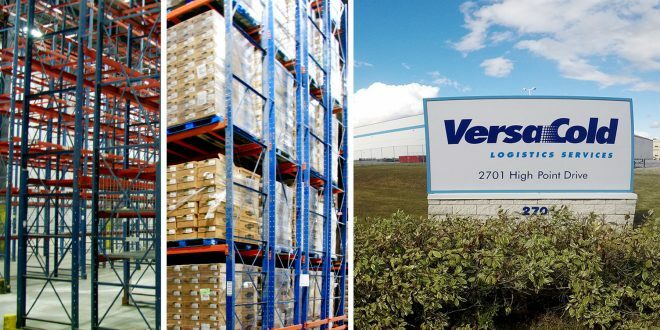 MILTON, ON – It’s freezing in VersaCold’s new distribution center in Milton, Ontario. Below freezing, actually, and that’s a good thing. Officially opened on January 11, the structure shares little in common with the Sobey’s warehouse that once called it home. It has been transformed into a fully temperature-controlled environment, with individual zones chilled to temperatures between 4 and -30 Celsius. Investments have been made in generators, boilers, and refrigeration panels alike. Concrete floors have been raised and re- poured in 11 seamless sections. 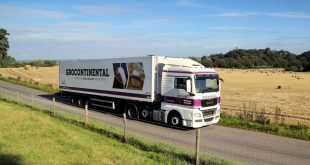 The underlying technology used to move pallets of frozen foodstuff has all been upgraded, even to the point of including voice-activated equipment. 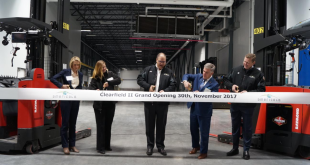 “The infrastructure is original, but inside of that it’s virtually a brand new building,” says Doug Harrison, president and Chief Executive Officer of VersaCold Logistics Services, which now boasts 43 distribution centers and terminals. The first two phases of this location already cover 255,000 square feet and enclose 9.2 million cubic feet. Once a third and final phase of the Milton site is completed later this year – doubling the current pallet capacity — the space developed in a partnership with Nestle Canada will be one of the nation’s largest temperature-sensitive distribution centers. Each day the facility will handle an average of 30 inbound and 60 outbound loads, representing 17 million cases of products per year. Nestle played an instrumental role of its own. “Our partnership has expanded to include all of our frozen business and to have this facility come to life,” said Nestle Canada president and Chief Executive Officer Shelley Martin, who remembers when VersaCold secured the company’s ice cream business in 2010. 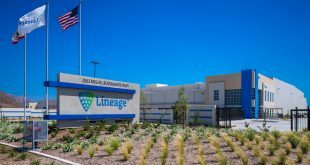 The coldest areas inside the Milton facility will store the ice cream, and about 2.7 million cubic feet of that will be shipped out every year — enough to fill 30 Olympic-sized swimming pools. A slightly warmer space will house the frozen pizzas, about 33 million of which will be shipped out in a year. Stretching end to end, those would stretch 1.5 times across Canada. As for the frozen meals? The facility can annually handle 51 million pounds of them, or the equivalent of about 70 loaded 747s. The first two phases of the Milton site features about 26,000 pallet positions, with goods moving through one of the 43 loading doors. Another 40 loading doors are coming in Phase 3. The various shapes and sizes of frozen foodstuffs are being accommodated with rack heights ranging between 56 and 98 inches, including single-selective and double-deep spaces. A facility of this nature will typically run at a capacity of 85-92%, Harrison notes. And that can warm a distribution executive’s heart.